Big Al's Barrie flyer Weekly Specials May 12 to 18, 2017. Fish e Sales Barrie Edition specials begin : Friday May 12th, Specials end : Thursday May 18th, 2017. Tropical Fish from the far east We've brought exotic imports from the best farms in Singapore, Malaysia and other locals! 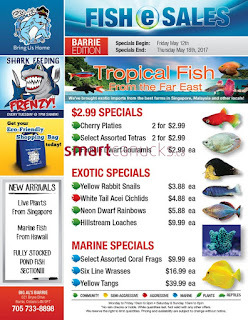 Cherry Platies 2 for $2.99, Select Assorted Tetras 2 for $2.99, Female Dwarf Gouramis $2.99 ea, Exotic Specials Yellow Rabbit Snails $3.88 ea, White Tail Acei Cichlids $4.88 ea, Neon Dwarf Rainbows $5.88 ea, Hillstream Loaches $9.99 ea. Just a simple click on the image bellow for details Big Al's Barrie flyer May 12 to 18, 2017. Big Al's Barrie flyer Valid May 12 to 18, 2017. Subscribe this category for more of Big Al's Barrie flyer products and deals.